First off, I have no issue with social media as a form of internet marketing—in fact, I think it is one of the best strategies out there. But, I know there are many who are slow to adopt it, or are interested in an article where the words ‘’share’’ ‘’like’’ or ‘’tweet’’ are not the focus. There are lots of great ways to market your business online that are free and that have nothing to do with social media. Here are just a few to get you started. It is important to note that when money is low, you have to invest more time. While some free online marketing strategies are set it and forget it, many will require some effort on your part. In the online world, high quality content can be a powerful marketing tool for your business; article marketing and guest blogging are two such ways to get said content out there in front of people who want what you are selling. 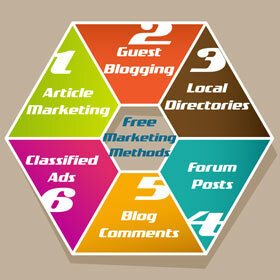 There are many free article directories where you can submit content, such as EzineArticles.com. Blog owners know the value of a constant supply of fresh content and guest blogging can help them achieve this goal. There are many ways to connect with bloggers looking for guest posts, such as BloggerLinkUp and MyBlogGuest. While I am a freelance writer, and not a business owner, I can still attest to the effectiveness of these two sites in placing guest posts for clients. Gone are the days when people are pulling out the Yellow Pages to find what they are looking for. Now, people are powering up the laptop or scrolling through a smart phone. There are a host of local business directories on the web that allow you to list your business absolutely free. A website such as GetListed.org, allows you to set up your listing on multiple directories at once, such as the online Yellow Pages, Yelp, Google and Yahoo. If people are looking for your type of business through an online search, you want to make sure you are on that list, otherwise, you are missing out. Forums (see our list of 7 High PR Internet Marketing Forums) and blogs are a great way to connect with prospective customers, whether they are individuals or other businesses. Here, people can share tips, advice, problems and just general helpful information in their comments. Being seen as someone who is knowledgeable about the topics being discussed is important when it comes to these types of online marketing methods. Posts where you can help people solve problems are particularly powerful. Because you can create a signature that includes a link, readers can easily visit your business’s website. Free classified ad sites can be a good addition to a free online marketing campaign; there are many out there that are highly trafficked, such as Craigslist. This site is actually one of the top 50 in the world—very, very good considering the number of websites floating around. Ralf's comment: I immediately liked the title and idea of this article. Social media is over-hyped. Mostly because it's a self-perpetuating beast. Social media consultants hyping sm are getting shared on sm by other sm consultants, getting shared further by their naive, inexperienced fans. No other marketing method has virality built in in its very fabric like this. A lot of social media marketing I see every day is built on wishful thinking. It doesn't produce the desired results. While social media has its place in your marketing mix, it's vital that you're indeed using a 'mix.' Kelli has mentioned a few methods to add to the mix!